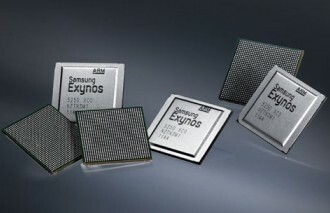 Samsung has announced their next-generation Exynos system-on-chip (SoC), the dual-core Exynos 5250. The new SoC features two Cortex-A15-based chips clocked at 2GHz each, resulting in a product that Samsung claims is twice as fast as 1.5GHz Cortex-A9 procesors. The 5250 will replace existing Exynos processors which can be found in current-generation Galaxy S II handsets. The Korean giant says the 5250 will be four times faster on the graphics front. As such, the SoC will be able to support higher resolution displays, up to WQXGA (2560 x 1600) which is much higher than anything available on the market today. Of course, it’ll likely be some time before we see a tablet approaching such a high resolution. In addition to increased graphics performance, Samsung has also doubled the memory bandwidth to 12.8GB/s compared to existing models. This is said to assist higher resolutions and speed up data processing. Power efficiency will also be improved on the 5250 thanks to an embedded displayport (EDP) interface that works with panel self-refresh technology (PSR). PSR allows a static image to be refreshed from memory rather than having to use processor cycles. Samsung introduced the Exynos 4212, a dual core Cortex –A9 chip clocked at 1.5GHz back in September. The 4212 featured a 32nm die shrink that was good for 25 percent more CPU power and a 50 percent boost in 3D graphics performance, all while consuming 30 percent less power. Samsung plans to introduce the dual-core Exynos 5250 in the second half of 2012 although it’s still too early to know which devices it will show up in first.